(Newser) – Objections by Sudan's government have held up the security mission of an elite Marine team that the US planned to send to Khartoum, a US official said today. As a result, the deployment has been delayed and possibly curtailed, according to the official, who spoke on condition of anonymity because the official was not authorized to disclose details on the troop movement. The Marine unit, known as a fleet anti-terrorism security team, was ordered to Sudan in the wake of violence and protests against the US embassy. good news now our marines wont get killed! we can get out of there stat and send in b52s instead! win win! These poor people have been lied to all of their lives, religion is the biggest hoax ever played on man kind. The federal reserve bank would be the number two as far as hoax's or fraud. The picture pretty much says it all. 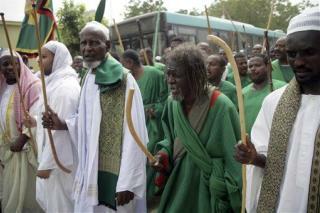 ALl American get out of Sudan and let the muslims do each other in.